I hope you're having a wonderful weekend! Yesterday was especially wonderful for me because I got to eat cake and host an event for this awesome community. As many of you already know, we had our Holiday Mashup yesterday. This event was my favorite event out of all of the events we've currently had. Thank you for making yesterday such an amazing Birthday! Keep reading this post to see what we did for our First Annual Holiday Mashup and a Halloween Run 2018 Announcement! I logged in very early on the event day to say hello to the very early birds - one of them being Victoria Thundershard which helped out a lot yesterday teleporting everyone - thank you, Victoria! Yes, around 5:00 am (seven hours before our stream would even begin), I was talking to amazing people in-game. Talking to them really reminded me why we have events like this in the first place. We have them to bring everyone together to something good that removes all negative stuff going on in your personal life to have fun. Most events, whether they're hosted by us or by other great people in the community, are a great way to make new friends and talk with old friends. I've stated this in the past, but I'll state it again.. Our main goal for these events is to bring everything in this amazing community together for fun. We love this community! Yesterday was a nice reminder of how amazing this community is. We started streaming this awesome event around 12:00 pm Central with a Dance Party. We streamed various activities and the main event for about 4 hours and 30 minutes! 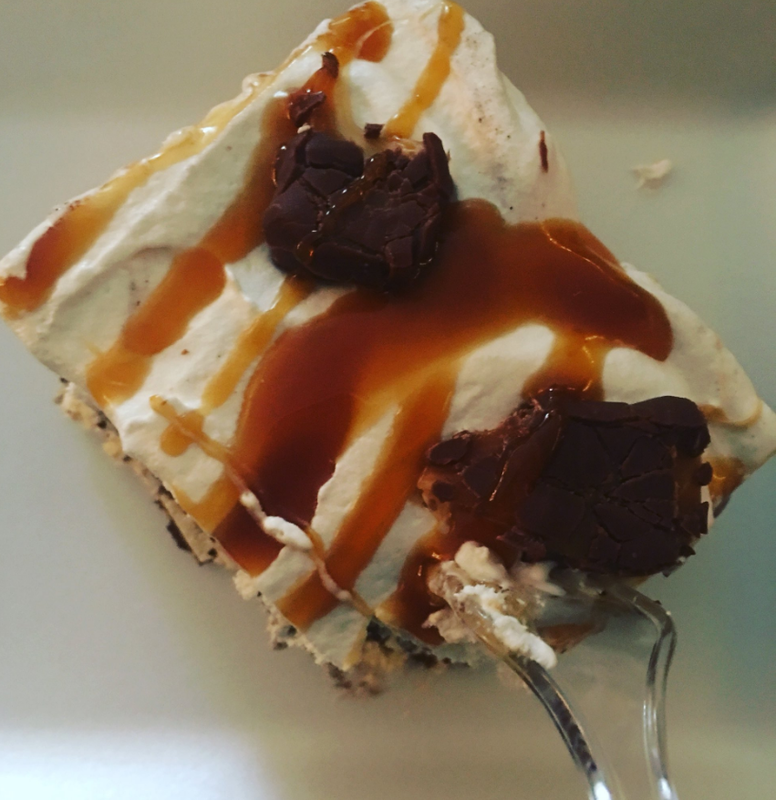 This was less time than our previous event, but that was because I was not going to miss out on my Birthday Ice Cream Cake. :D I love this community, but... I mean look at the image below. You can't tell me that doesn't look good! I'm pretty sure a lot of you weren't expecting to see that, but there you go. This Twix Ice Cream Cake was delicious. Yum! So other than the delicious cake above, I have to say that yesterday was one of my best Birthdays. I had a great time online and offline. It was so nice hanging out with all of you! I already wish we could have another major event, but these do take many hours to plan out. There is no way I could prepare all of this on my own, so I really would like to thank our hosts and port wizards for all of their hard work helping me put this together for this community. Behind the scenes, it takes quite some time to prepare events like these, so each time we have an event, please thank the hosts as well. Now, it may seem like I'm done with my Recap Post, but I'm not. I'm now going to list a few favorite moments of this event! One amazing thing during this event was that Autumn Dreamwalker planned out a surprise for me for everyone to sing Happy Birthday to me. I later found out that she was going to have this surprise, but that didn't keep me from blushing for about 20 minutes after! This community truly is amazing. I'll always remember this moment. Thank you so much for all of your Birthday wishes yesterday. There were so many that I was unable to thank everyone. I'll thank everyone here on this post for now. Thank you again for making my 25th Birthday an amazing Birthday. Another great moment of this event was the Christmas Caroling. We started caroling for events last Christmas. 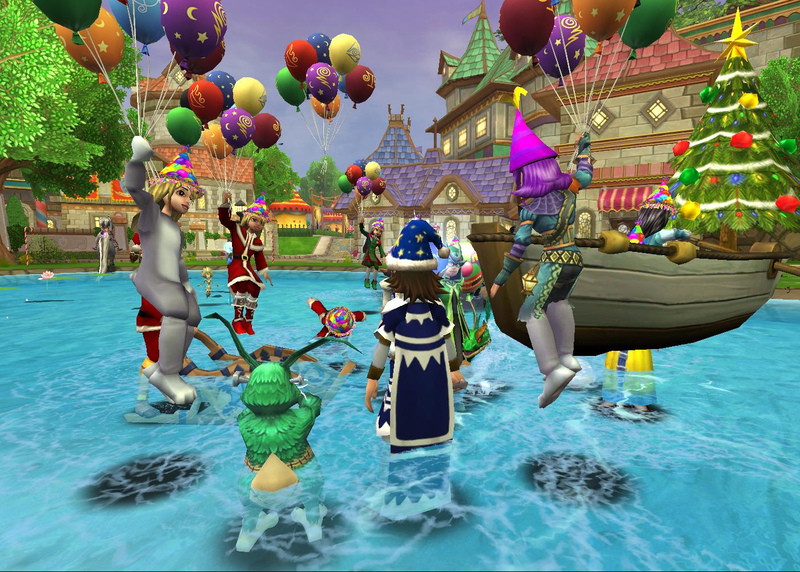 We went all over Wizard City from the Shopping District to The Arena singing our favorite Christmas Carols. This activity was one of my favorite activities from yesterday. An amazing moment from this was that we went up to a wizard named Sierra Soultamer in the Shopping District. We started singing "Hot Chocolate" by Tom Hanks. Now at first, she was confused, and rightfully so! And after we told her what was going on, she appreciated our caroling! She even joined the event, which was amazing. Thank you so much, Sierra, for joining this event. We hope you had a lot of fun at the remainder of the event. Our main event, the Holiday Mashup Run, began around 3:00 pm Central. This time was a little different from other times though.. We had Rubber Ducky mounts! 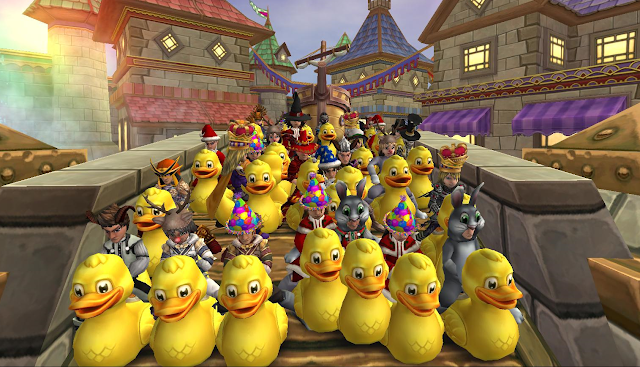 I'd like to thank Tom Purdue for making codes for a 1-Day Duck Mounts to be given away during our event. It really was cute to see these ducks hopping around Wizard City. The codes quickly ran out, so a few were unable to get these and I apologize for that. If we ever do something like this again, I'll be sure to ask for a few more just in case. Other than that, this was my favorite moment! I think everyone had a laugh or two, especially when we started playing "The Duck Song" while running around Wizard City! Shortly after the Run, our amazing port wizards teleported everyone to the afterparty houses. These houses were decorated and put together by Michael Wildflame (Battlemage Keep) and Sarah Skystrider (Massive Fantasy Palace). These houses were amazing and it was so nice seeing everyone have fun. Did you know that they also had contests of their own? They are amazing. Thank you so much, Sarah & Michael, for your hard work. Speaking of our amazing co-hosts, I'd like to formally shout-out everyone that helped us out with this event. Please give them a follow if you get a chance! I'd also like to thank all of you for supporting our events. A lot goes into preparing for events like this, but at the end of the day, all of you make all that work well worth it. Keep supporting those who make a positive change in the community. That's one way we can all work to bring the community together. This is one community. 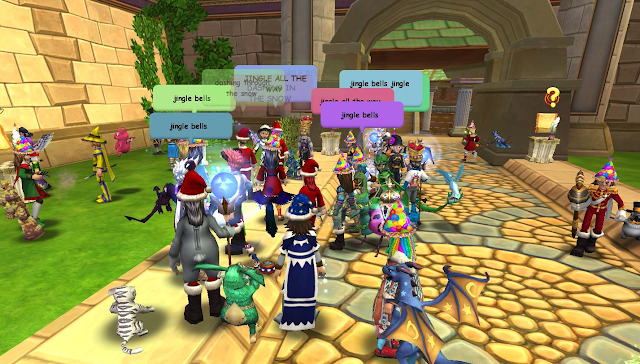 It's the Wizard101 Community. Thank you again for your support. I hope to see you at our next major event, our 3rd Annual Halloween Run! Spread the word. We'll share more information about this event over the next few months. In the meantime, you can watch our stream from this year's Holiday Mashup by clicking on the link below.